Recent events in Wisconsin and a number of other states have focused attention on the role played by labor unions in contemporary American politics. As Scott Walker and other conservative Republican governors have sought to reduce the power of public employee unions in their states by weakening collective bargaining rights, the unions and their supporters have fought back with demonstrations and efforts to recall Republican elected officials who have supported these policies. One common progressive criticism of Republican efforts to undermine public employee unions is that these policies are aimed more at weakening the ability of unions to support Democratic candidates in future elections than at reducing state budget deficits. There is no question that unions, and especially public employee unions, remain a major source of funding and campaign workers for Democratic candidates. In 2010, for example, three public employee unions (SEIU, AFSCME and the NEA) were the leading independent spenders on behalf of Democratic candidates, and unions continue to provide large numbers of volunteers for Democratic registration and get-out-the-vote drives. But aside from providing financial support and campaign volunteers, how important is the union vote for Democratic candidates in the second decade of the 21st century? In assessing the importance of any group of voters to a political party’s electoral coalition, two factors must be taken into account: the size of the group and the loyalty of group members to the party and its candidates. In the case of union voters and the Democratic Party, both of these measures have been declining for some time. 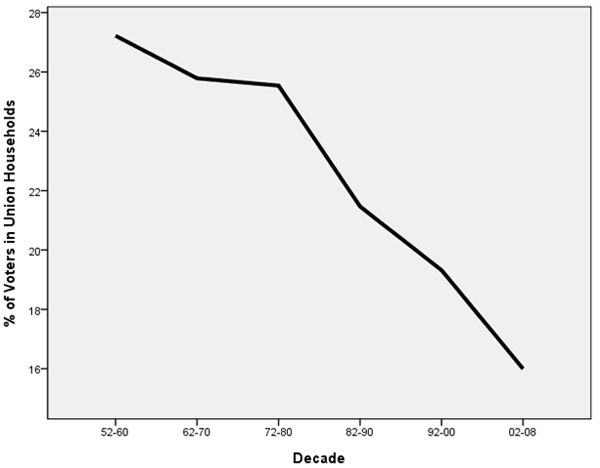 Figure 1 displays the trend in the percentage of voters belonging to union households by decade since the 1950s based on data from American National Election Studies. The data show a steady downward trend reflecting the decline in the proportion of American workers belonging to labor unions over this time period. In 1952, 28% of voters were members of union households; in 2008, only 13% of voters were members of union households. Source: American National Election Studies Cumulative File. Along with the steady decline in the size of the union vote, there has also been a fairly dramatic decline in the loyalty of union voters to the Democratic Party since the 1960s. 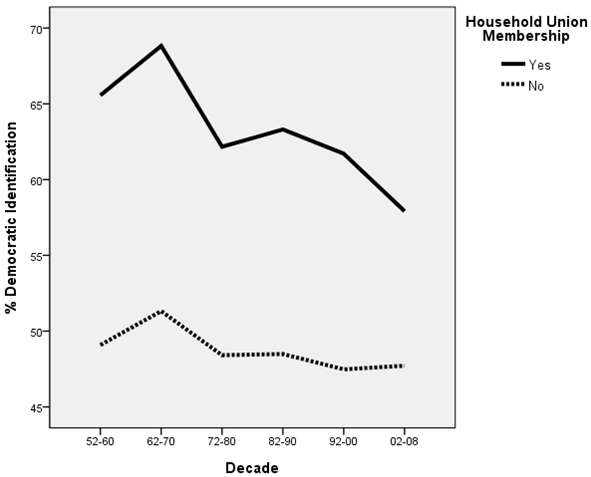 Figure 2 displays the trends in identification with the Democratic Party among voters in union and non-union households over the past six decades. Democratic identifiers here include independents who lean toward the Democratic Party as well as strong and weak partisans because these leaning independents generally vote more like partisans than like true independents. While party identification is not a perfect predictor of vote choice, it is strongly related to candidate preference and therefore provides us with a broad measure of the partisan orientation of voters across many types of elections. The data in Figure 2 show that attachment to the Democratic Party among voters in union households peaked in the 1960s. 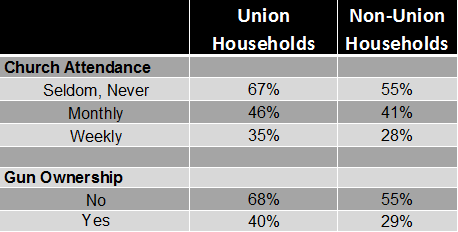 At that time, 69% of union voters identified with the Democratic Party compared with 51% of non-union voters. By the first decade of the 21st century, however, Democratic identification among union voters had fallen to 58%compared with 48% among non-union voters. While union voters remained considerably more attached to the Democratic Party than non-union voters, the gap between the two groups had shrunk considerably due mainly to declining Democratic identification among union voters. The decline in Democratic identification since the 1960s has been much greater among some types of union voters than among others, however. Among African-Americans, who have gone from 10% of union voters in the 1960s to 13% today, there has been no decline in Democratic identification. Between 89% and 93% of African-American union voters identified with the Democratic Party throughout this time period. Among white union voters, however, Democratic identification fell from 66% in the ’60s to 51% in the 2000s. Moreover, the decline in Democratic identification among white union voters has been greatest among socially conservative groups such as regular churchgoers and married men. Among regular churchgoers, Democratic identification fell from 67% in the ’60s to 40% in the 2000s and, among married men, Democratic identification fell from 68% in the ’60s to 44% in the 2000s. Evidence of the limited influence of unions on the voting behavior of their members can be seen in the 2008 presidential election. According to the 2008 National Exit Poll, 60% of union voters cast their ballot for Barack Obama compared with 52% of non-union voters. Among nonwhites, however, there was no difference between union voters and non-union voters: 79% of nonwhite union voters cast their ballots for Obama but so did 82% of nonwhite non-union voters. Source: 2008 National Exit Poll. Note: Entries shown are logistic regression coefficients with corresponding standard errors. Dependent variable is presidential vote coded as 0 for Obama and 1 for McCain. Change in probability is based on difference between lowest and highest value of each predictor while controlling for all other predictors. Among whites, there was a significant difference between union voters and non-union voters, with 52% of the former casting their ballots for Obama versus only 43% of the latter. Even among whites, however, the impact of union membership on the presidential vote was rather modest. 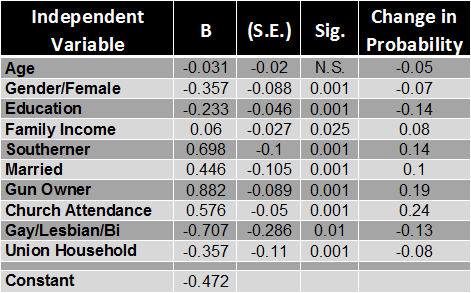 Table 1 displays the results of a logistic regression analysis of the 2008 presidential vote among whites based on data from the National Exit Poll. Logistic regression is a statistical technique that allows us to estimate the effects of several independent variables on a dichotomous dependent variable, such as vote choice. The estimated changes in the probability of voting for John McCain can be used to compare the effects of the independent variables included in the analysis. The results indicate that union membership had a relatively small influence on vote choice compared with several other predictors. For example, the estimated impact of union membership on the probability of voting for McCain was a decrease of 8% while the estimated impact of gun ownership was an increase of 19 percentage points and the estimated impact of regular church attendance compared with non-attendance was an increase of 24 points. The results of the logistic regression analysis indicate that the pro-Democratic impact of union membership on white voters can easily be outweighed by the pro-Republican impact of other characteristics, such as religious observance and gun ownership. This can be seen very clearly in Table 2, which displays the 2008 presidential vote among whites by church attendance, gun ownership and union membership. While union voters were consistently more likely to cast their ballots for Barack Obama than non-union voters, the differences in presidential preference based on church attendance and gun ownership were much larger than those based on union membership. Moreover, the large majority of union members who were regular churchgoers or gun owners cast their ballots for John McCain. Thus, it appears that when white voters experienced a conflict between their identity as a union member and their identity as a regular churchgoer or gun owner, their identity as a regular churchgoer or gun owner had a stronger influence on their candidate choice. While labor unions remain a crucial source of financial support and campaign workers for the Democratic Party and its candidates, union voters make up a much smaller component of the Democratic electoral coalition today than in the past. This is due to both the decline in the proportion of voters in union households and the declining loyalty of union voters to Democratic candidates. Part of this decline in loyalty reflects the impact of cross-pressures on the voting decisions of white union members who are also either regular churchgoers or gun owners. Evidence from the 2008 National Exit Poll indicates that even in an election in which the economy was the dominant issue, both church attendance and gun ownership exerted a substantially stronger influence than union membership on candidate preference among white voters. It remains to be seen whether an increase in the salience of issues affecting unions such as the collective bargaining rights of public employees will alter this pattern in 2012.